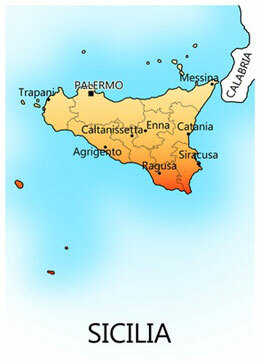 Sicily is an autonomous region of Italy and also the largest island in the Mediterranean Sea. It also comprises minor islands such as the Aegadian Islands, Aeolian Islands, Pantelleria, Lampedusa. 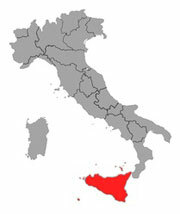 Its official name is Regione Autonoma Siciliana (Sicilian Autonomous Region). Sicily, like all regions of Italy, has its own rich and unique culture, especially with regard to the arts, music, literature, cuisine, architecture and language. Sicily also holds importance for archeological and ancient sites such as the Necropolis of Pantalica, the Valley of the Temples and Selinunte. The archaeological site of Selinunte contains five temples centered on an acropolis. Mount Etna, located in the east of mainland Sicily in the province of Catania, is the largest active volcano in Europe. 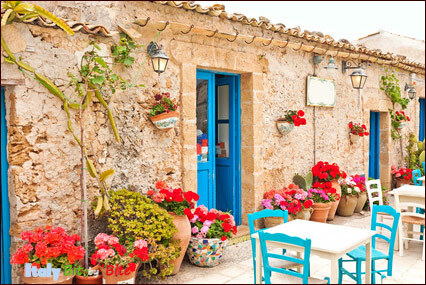 Sicily is situated in the southern Mediterranean, no more than 100 miles from the north African coast, so it benefits from a warm and sunny climate for much of the year. Even the winter months are mild along the coasts, with daytime temperatures in the low 60s, or 15-16˚C. However, inland it can be quite cold and stormy, with sufficient snow for skiing and sledging on and around the Etna in January. Spring is a delight, with daytime temperatures in the mid 60s F or 18-20 ˚C, and only occasional rain. Sea temperature is still relatively cold to swim. At Easter time many of the towns have religious festivals in which processions and re-enactments of the events leading up to the crucifixion attract many tourists. The temperature by mid April is usually in the low 70s F or between 22 and 23˚C while the sea temperature has risen to 16˚C , so swimming is possible, but not very enjoyable! The rainfall season is almost over but if you do catch a rain storm it can be surprisingly heavy. In May the temperature is beginning to rise quickly. The average for mid May is 81-84˚F, or 27-29˚C and almost every day is sunny. The sea temperature has risen to 19˚ C. Summer really really starts in June in Sicily. Average temperatures are 90˚F plus or 33-34˚ C and days are either sunny, or very sunny! In July and August the air can be very hot and dusty if the Scirocco wind is blowing from the Sahara. 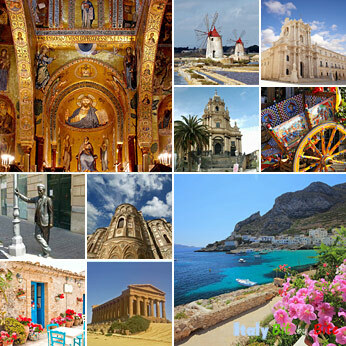 Photo credits (top to bottom): Sicily collage made by Italy bit by bite from photos by © bepsphoto/Fotolia.com (Siracusa duomo), by SlowItaly/Italybitbybite (Agrigento temple), © lucamorreale/Fotolia.com (colored street Siracusa), Rosino (Mozia wind mills), © V. Zhuravlev (Monreale church), Paula Kirby (Montalbano statue).